Do You Know Who to Call for Water Damage in Your Home? If your home’s interior has water damage, it can be overwhelming to know what to do first. 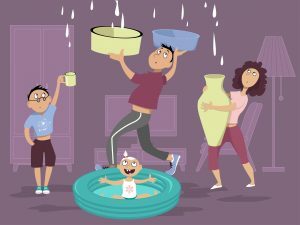 Your initial stress will likely come from the awareness that your basement is flooding, your ceiling is bulging, or your toilet is overflowing. Once that sinks in, further anxiety arrives as you try to play damage control and minimize any further destruction to your home. After a deep breath and turning off the home’s electricity and water supply should a burst or leaking pipe be the possible culprit, it’s time to pick up the phone. But who do you call first? On one hand, you know the water needs to be extracted and the area dried to limit the occurrence of mold. On the other hand, it’s imperative to address the water source to ensure no more water comes in. To top it off, you may need to restore your home, replacing carpeting, hardwood flooring, drywall, or other elements wrecked by water damage. There are a lot of steps and options, but don’t fret! We’ve prepared the following questions to help you easily determine who to call and when. Are You Able to Stop or Control the Incoming Water? Yes: Proceed to the next question. No: Call a Professional Plumber. If you answered no, your first call needs to be to a professional. Most likely that person will be a plumber or an appliance repair person. A plumber can tend to all water systems in your home, including water, sewage, and drainage pipes, as well as many appliances, such as dishwashers or washing machines. Do You Have a Homeowners Insurance Policy? No: Proceed to the next question. Yes: Call your insurance agent or company. Reaction time is critical when water is seeping in, and your insurance professional can act as a knowledgeable guide leading you down the quickest route back to pre-loss conditions or “normal”. If you don’t have a reliable go-to restoration company, plumber, or other needed professional, follow the advice of your insurance professional to get on the right course of action. Your insurance agent will assist you in getting the claims process started to help pay for repairs. Is the Water Source Fixed or Just Contained? Fixed: Proceed to the next question. Contained: Call a plumber or appliance repair person. At this point the water should be under control, but that doesn’t mean the problem is necessarily fixed. For example, if you shut off the water supply to a leaky pipe, the pipe needs to be repaired or replaced in order to turn the water back on without incurring more damage. Do you have standing water, dampness, or other water damage? No or minimal (meaning a few towels and a fan can dry it up): Sounds like it’s back to home sweet home. Yes: Call your local restoration professional now. Restoration technicians will work quickly to remove and extract the water and dry the damp areas using the appropriate drying equipment. Once the everything is dry and protected from potential mold, the restoration company will advise and perform any repairs or reconstruction that is needed to return your home back to its original pre-loss condition. A quick tip on the reconstruction or rebuilding phase, it’s a great time to talk about any upgrades or changes you’ve always wanted to make with your Project Manager. This would mean a cost difference but it’s a perfect time to make those changes to your home.